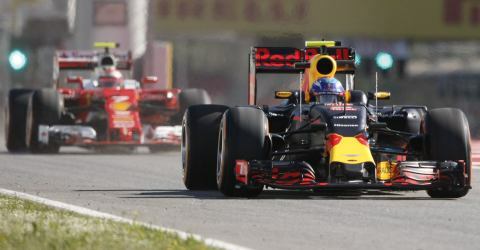 Traditionally, the racing season in Europe begins with the "Formula One Grand Prix of Spain". The Formula 1 race at the 4.655-kilometres Circuit de Catalunya near Barcelona is the motorsport event in Spain. Here you can book the tickets and get information about the race, the racetrack and how to get to Montmeló. The seats are at least in pairs next to each other. We are happy to fulfill your seating requests if that's possible. Please send us an e-mail immediately after booking. We can not give a guarantee that we fulfill special wishes. We will send you the tickets by e-mail. If you don't have the e-mail in your mailbox, that is usually due to the spam filter. Not receiving the ticket due to the spam filter does not justify a refund. We have no influence or insight on your spam filter. It is your responsibility to check your spam filter and let us know if you have not received a ticket, so we can also send it to another email address if needed. Traditionally, the Formula 1 season in Europe begins in Barcelona / Montmelló. 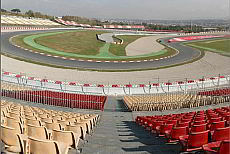 Since 1991 Formula 1 races have been held at the Circuit de Catalunya, near the remote town of Montmeló, about 20 miles from Barcelona. The track is 4,655 km long and has 16 turns, which are driven through 66 times. In addition to hosting the Formula 1 race, the Circuit is a popular test track for Formula 1 and motorcycle teams. Typical of the route are the long corners, which are driven at high speeds, so the tyres of the cars are severely tested; vehicles with better aerodynamics have an advantage here. The Circuit de Catalunya is a technically demanding, but fast race course; all cornering speeds - slow, medium, and quick - are required. Michael Schumacher won his first Formula 1 race for Ferrari here in 1996. With a total of six wins Michael Schumacher has the record number of victories at the Circuit de Catalunya. Between 1969 and 1975 Formula 1 races were run on the street circuit on the Montjuïc hill, Barcelona. Apart from Formula 1 this is also the home to Moto GP, one of the more important races. Please note that the race ground is very spacious and with uncovered seats you are exposed to the sun. Sun protection is essential. Come early on the event days: in the morning, in addition to the Formula 1 events, there will be other races of other racing formulas. Leave plenty of time to go after the last event. You can still eat and drink in peace. That way you can skip the traffic. Essentially, there are three ways to get to the race track at Montmeló: by train, by bus and by car or mobile home. Here we describe the route with maps from Barcelona and Girona. The racetrack can be visited daily, except on race and training days. The tour lasts about 1-1.25 hours and includes the most important places in a Formula 1 race: the briefing room, the winner's gallery, the press room, the TV room, the VIP zone, the boxes and the paddock. Tickets and parking spots for the Formula 1 Spanish Grand Prix. During the private sailing trip the boat and skipper are available exclusively for you. A lot of fresh air. Book tickets for Casa Mil� here. No queuing at the ticket office. Experience the legendary FC Barcelona in Camp Nou, Europes largest football stadium.